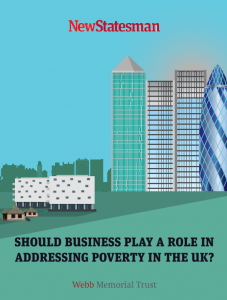 Should business play a role in addressing poverty in the UK? Who should solve the problem of poverty in the UK? This is a central question posed by the Webb Memorial Trust in its latest research to define a good society. Our answer is: everyone. This answer contrasts with the current polarised debate about poverty. Some think that the government is responsible, while others say that it is down to the individual. This is a false dichotomy because both have a part to play – as do many agencies. In this special supplement, we examine the role of business, previously a neglected area. Companies are in the spotlight because the UK government is vigorously seeking work-based solutions to poverty and at the same time moving people off welfare. So what is the role of business in reducing poverty? To explore this, the Webb Memorial Trust commissioned Slack Communications to talk to a range of employers. Here we give the results.